Global law firm Hogan Lovells has begun recruiting 20 lawyers in Birmingham ahead of a new office opening this autumn. The legal giant has already begun interviewing corporate, finance, litigation and real estate lawyers for a new legal services centre opening in the city. It is following in the footsteps of Deutsche Bank in shifting some operations out of London to Birmingham to take advantage of reduced costs. The centre will be led by former global private equity head Alan Greenough, who is returning to the city after a three-year spell at Pinsent Masons in Birmingham in the 1990s. He told the Post the new operation would be an "extension" of the London office with lawyers in Birmingham working alongside counterparts in the capital. He said: "Like everyone else we have got a lot of clients, particularly the banks, saying that we need to offer the same quality of service at lower costs. "The legal services centre in Birmingham is the main initiative to deliver that. The thinking behind it is there is a lot of legal work which could be done as effectively out of London but at a lower cost. "It will be a part of the London office – the lawyers there will work with the London teams on transactions." 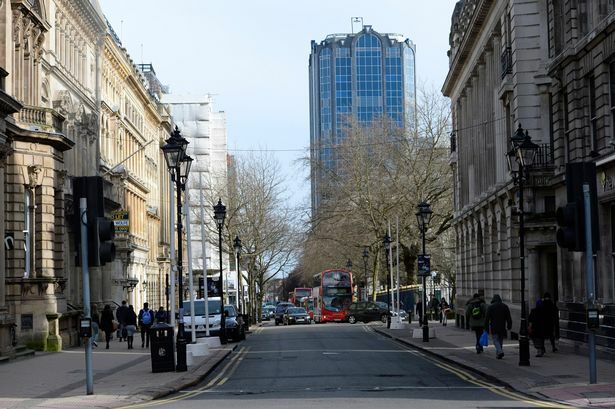 Hogan Lovells has found a premises in the Colmore business district but is yet to finalise terms. The centre will work on areas such as document review processes, due diligence and real estate licensing. A wider efficiency drive at the firm, which is co-headquartered in London and Washington DC, has also seen some back office functions moved to Johannesburg. Hogan Lovells was formed by the merger of Washington-based Hogan & Hartson and London-based Lovells in 2010. Today, it is one of the world&apos;s biggest law firms, employing about 2,500 lawyers working out of more than 40 offices in the United States, Europe, Latin America, the Middle East and Asia. The vogue for law firms shifting operations out of the capital is well-established. The likes of Allen & Overy, Herbert Smith Freehills and Axiom have all set up operations in Belfast while Ashurst has invested in offices in Glasgow. Mr Greenough said Hogan Lovells considered other cities before opting for Birmingham. He said: "We looked at several locations but Birmingham won because, first of all, it is quite close to London and it has a strong legal community, so we can find the people we want, as well as good transport links. "We expect to do well and we expect to grow. Other law firms which have set up similar operations have," he added. Mr Greenough was set to retire from the firm and his role as global head of private equity, this year but will stay on to run the Birmingham operation until the end of next year at the earliest. He worked at Pinsent Masons&apos; Birmingham office between 1994 and 1996. It is a key part of Birmingham&apos;s inward investment strategy to encourage professional services operations to the city from London, with Deutsche Bank, which has grown its team from fewer than 30 to more than 2,000 in the city, the principle feather in its cap. The Post previously reported that, while the German-owned bank first started out creating back-office jobs, it is now servicing 500 clients previously handled by London across debt, listed derivatives and cash equities, with a 270-seat trading floor on the way.